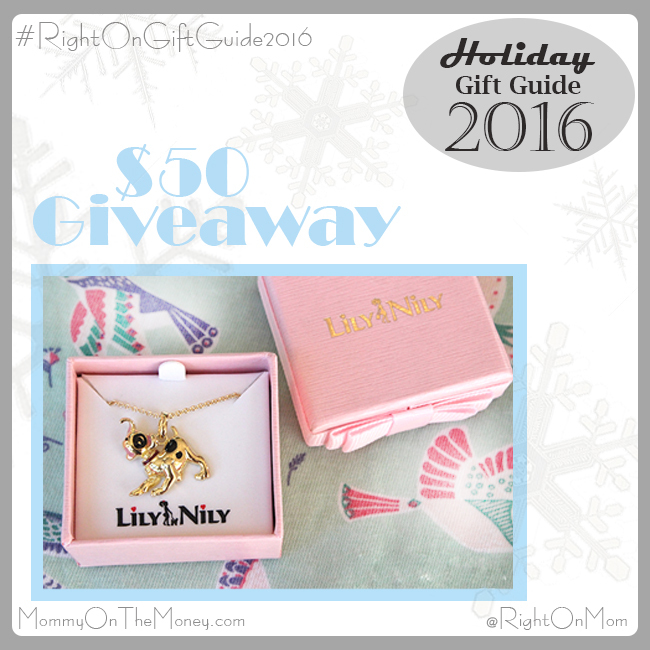 One of our favorite jewelry companies for little kids is and featured in the 2016 Right On Gift Guide is the lovely Lily Nily. They make beautiful 18k gold plated brass jewelry with colorful enamel packaged in an adorable ribbon wrapped pink boxes. Our daughter is best friends with our doggie so we accessorized her bird patterned jumper from Tea Collection with a little dalmatian puppy pendant. Lily Nily is high-end jewelry made in the US, right in the historic Brooklyn Navy Yard. The pieces are designed to be both precious and adorable. They are hand painted, and conform to lead and cadmium requirements for children's jewelry. Right now, we are giving one reader an opportunity to win a $50 Gift Card to Lily Nily! NOW IT'S TIME FOR A GIVEAWAY!!! We are giving ONE lucky winner a $50 Gift Card for LilyNily so they can select their own piece of jewelry for a prize! Must be 18+ years or older. Giveaway is open US only. *Giveaway is not associated with or endorsed by Amazon, Facebook, or their associates. MommyOnTheMoney.com is not responsible for the prize. Lily Nily is the prize sponsor and will be responsible for providing the $50 gift card and reserves the right to substitute a prize of similar value. Winner will be contacted via email and will have 48 hours to claim their prize or we will select another winner.